St. Luke xviii, 29 &30. 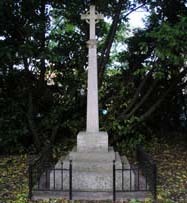 The handsome memorial cross of Portland Stone, which was erected in the churchyard was unveiled and dedicated in the midst of a heavy storm on Saturday May 29th 1920. The whole of the service was arranged to be held in the open air, but the sudden downpour of rain altered all plans and the large congregation assembled in church. A large number of ex-servicemen were present and occupied the front seats. The Vicar conducted the service and read the prayers and a suitable and earnest address was given by the Reverend R F Priestley the Wesleyan Minister; the Primitive Methodist Minister was invited but was unable to be present. Several well known hymns were sung and Mr Priestley read the passage from Ecclesiasticus xliv beginning "Let us now praise famous men ..." and including the text on the monument "Their name liveth for evermore". When the procession of officials and ex-servicement went to unveil and dedicate the cross the rain was extremely heavy. 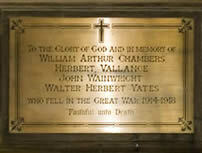 Major Bell performed the unveiling ceremony, the Vicar read the dedicatory prayers, and the "last post" was sounded. Then the whole congregation re-assembled in church for the concluding part of the service and an address by Major Bell. Several wreaths were placed at the foot of the memorial, including a very handsome one brought by the comrades of the fallen soldiers. The collection made at the service in aid of the Memorial Fund amounted to £4 18s 2d. Click here to be directed to the Beckingham All Saints' Church. Click here to be directed to Saundby St Martin's of Tours Church. It is believed that no one from Beckingham or Saundby was killed during the 2nd World War, although a John Taylor from County Durham who had only a month previously married a Beckingham lady, Barbara Egar, and who had his war time address as Beckingham, was killed on 10th June 1944. John Taylor was based at Kelstern Airfield and his Lancaster Bomber was shot down over the French town of Bois D'Arcy. "With the passage of time, air raid stories, which cannot be told except in brief announcements of damage ‘in the North Eastern district’, to use one of the familiar phrases after enemy bombardments from the air, permits the ‘News’ to give more details of the experiences of the miniature ‘blitz’ on the villages of Beckingham and Gringley on the Hill, near Gainsborough, over six months ago. These two villages, lying over a mile apart, had a night of intense bombing: not that it was deliberately aimed at two such peaceful parishes of rural North Nottinghamshire, but it just seemed that a lone raider, probably flying aimlessly after losing its bearings, happened to drop a few incendiaries, which did little damage but which brought a hail of more incendiaries and high explosives from other enemy bombers attracted to the area. Only the fact that these two villages are sparsely populated areas prevented serious casualties, for the raid lasted several hours. Strange though it may seem, with the number of high explosives dropped, not a single person was seriously hurt." The attack commenced some time after nightfall, on a Thursday night which will be remembered for the whole of their lives by the residents not only of the two villages concerned, but by those living within a radius of a number of miles. The first incendiaries dropped simply ignited scrub and tufts of grass in the fields, and these harmless fires – often just the incendiaries themselves burning – attracted the attention of nuisance raiders, whose task presumably is to attack the morale of the people. In this, however, they failed, for after the raid everybody was determined to do what lay within their power to help win this battle for freedom against a fiendish enemy, who scorns the elementary ethics of humanity. High explosives continued to drop within a radius of two or three miles at intermittent intervals, with batches of incendiaries here and there. These set a small plantation alight, but did no other damage. Two bombs were dropped at Beckingham, one each side of the railway lines, making great craters which were filled in by workmen in quick time. Windows of the nearby Vicarage were blown in, a third bomb dropped in the garden of Mr A Vasey, causing extensive damage to two nearby houses and damage to a greater or less degree to a few other houses, while windows of the Parish Church were shattered. Gringley had many more bombs, however, but here little was achieved because most of them fell in fields and on the famous Beacon Hill, one of the highest points in North Notts. Chief damage at Gringley was to the farm of Mr H Teasdale, where most of the farm buildings were wrecked and damage was also caused to the farmhouse, again without causing serious personal injury. There were also stray bombs in the area. One dropped some distance off the Gringley Road, causing a good deal of damage to farm buildings belonging to Mr F Bell, and a stick of high explosives was also dropped at the top of Ramper Road, all of the screaming type. Others fell harmlessly in fields, in one of which were eight craters. Civil Defence Services and other volunteers were ready to render assistance should it be needed, but in the absence of direct hits, or of the complete demolition of houses, no rescue work or first aid treatment was required. Both villages had previously had narrow escapes from high explosives. At Beckingham, over a year ago, bombs were dropped in a line, doing little or no damage, while at Gringley, bombs were previously dropped in a field on the Carr Farm of Mr T Nelson, the only causualty being a pony, which died from shock."